Good Afternoon my crafty friends and Happy Father's Day to all those amazing Dads out there!! !I hope you are all enjoying the weekend! I included this collage photo of her little munchkin....quick and simple! They are random pictures of her from the time she was born to now.....I can't believe it by Arya is 2 1/2 already!! I just love the middle picture of her! I happen to get up from my computer to go get something and when I returned she was in my seat wearing my glasses saying...me turn on the puter, Nanny! Oh my gosh, I about died laughing! I am SURE she couldn't even see out of my glasses, lol?!? I just love having her around!! I started with a MDF coaster and painted it with black craft paint. I cut the paper to the appropriate size to fit the coaster. The pattern paper is from Paper Studio. I then cut a small mat for the photo to sit on, rounded the corners and adhered it in place. I cut a small piece of washi tape and ran it along the bottom of the photo. The chipboard hearts are from Michael's which I inked up and added a twine bow along with a fun little striped button. The flower is cut at 3" from the Art Philosophy cartridge and the center piece is from the floral department at Hobby Lobby. 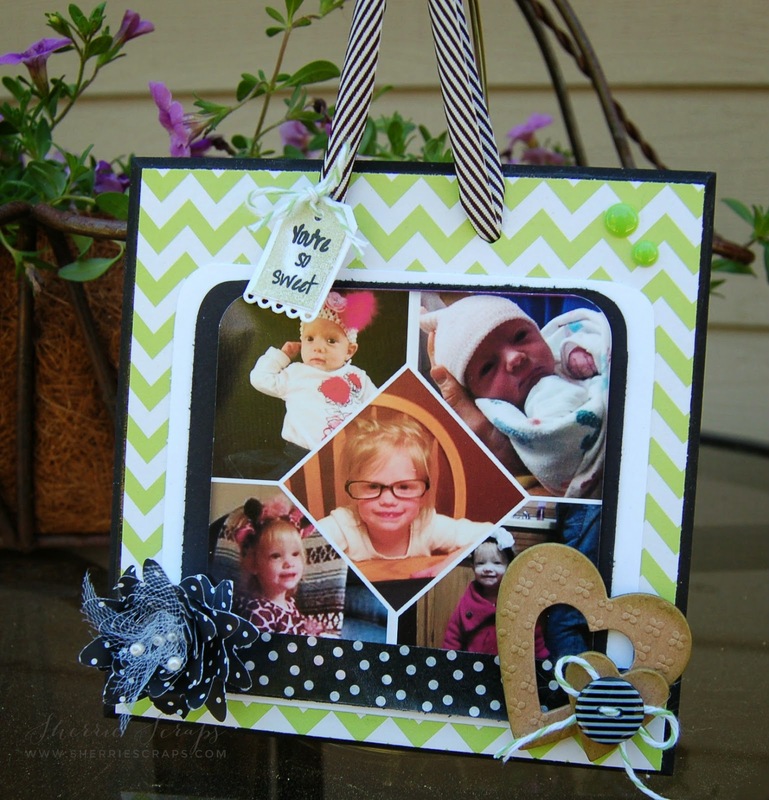 I tied on some fun striped ribbon that was in my stash to the frame and added a cute tag. The tag is created using My Craft Spot's Tiny Tags metal die and Tiny Tags stamp set. Oh my gosh, Sherrie, she is so sweet and adorable I can't stand it!! How can she be 2 1/2 years old already??!! That middle picture of her wearing Nanny's glasses is priceless!! What a beautiful way to display her!! I love the design and embellishments you added!! This will look amazing in your daughter's office!! Fabulous project. Your daughter will love having this in her office. It is so fun to see how Arya is growing up. I love the green and white against the black. Good luck with all of your upcoming events. Hi my sweet friend! Your sweet wall hanging is just darling (how could you go wrong with a cutie pie like Arya front and center)! Love the great chevron paper and the pop of black. 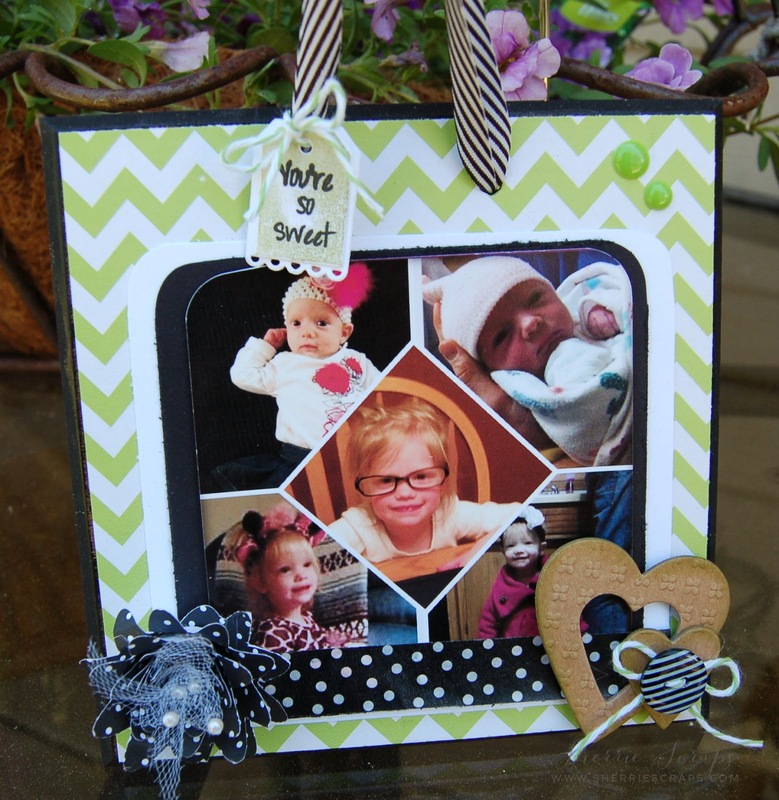 Your embellishments are just perfect to highlight those adorable photos! Time does just seem to fly doesn't it? It seems to go by even faster once the grands come along. Good luck with all your projects, I look forward to seeing photos of everything you are working on. Have a great week and I'll check in on you later! Ohhhhhhhhhh this is gorgeous! I love love love love the colors, the flower and the way you designed the photos!!!!! WOW! Sherrie:) she is so cute and they sure do grow fast, your daughter is going to love it:) Thank you for joining Krafty Girls Face challenge:) Have a great evening!! I can't wait for wedding pics, I know you guys are going to do a fantastic job and I really think a fabulous time is in order after all the challenges you guys faced. I hope you're still getting some good weather. We have been so spoiled lately :) took a bike ride for Father's Day about 4:00 pm and it was truly amazing....the beach was picture perfect. What a lovely hanging decoration...perfect for our cas challenge at Loves Rubberstamps, thanks for joining. This is so precious, and I adore the middle pic especially the store behind it. I know your daughter must have loved this to pieces. What a treasure. I can't imagine how busy you must be. Looking forward to you sharing pictures with us. She is adorable and is getting so big. Where does the time go? Love all the pics but my fav is the one in the middle. What a fabulous keepsake. Have a creative day. Your wall hanging is just Precious!! Darling pictures. Adore the fun tiny tag and Gorgeous flower. absolutely gorgeous gift. hope you had a great weekend! My dear friend, this is all things sweet and beautiful! I cannot believe Arya is 2.5... where has the time gone?! She is such a sweetheart, which those photos so perfectly show! I LOVE this project and every detail you put into it. :o) It will be a ray of sunshine to everyone's heart who sees it. :o) Fantastic work, Sherrie! I'm thinking of you and sending you lots of hugs! This is such a beautiful little gift for your daughter. I am sure she loved it. Love the middle picture and the story behind it. Have a great week!! I think this is so beautiful , and wonderful !!! What a great way to express your love !!! Hope you have a wonderful day !! This is just about as cute as can be! I love all your sweet details...so cute. OMG Sherrie! This is so super AWESOME!!!!! LOVE those adorable pictures and boy did you decorate this to perfection! Oh this is ADORABLE Sherrie! I think she is such a CUTIE and I LOVE the idea, the design and the fun cheerful colors! We aren't going anywhere and I totally get it about being busy! Enjoy doing all the stuff for the wedding! Aww this is just way to cute.